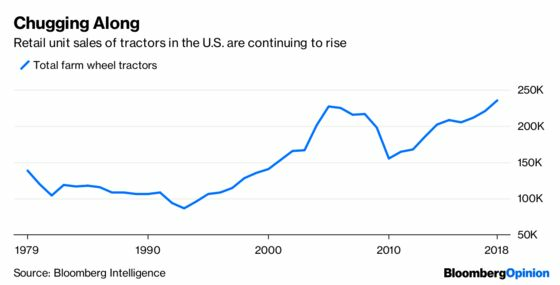 (Bloomberg Opinion) -- The world’s second-biggest tractor maker is getting stuck in the mud, just as the U.S. farm machinery market shows resilience amid the trade war with China. U.S. tractor shipments rose almost 6 percent in December from a year earlier and surged 63 percent compared with November, data from the Association of Equipment Manufacturers showed last week. Full-year sales climbed almost 9 percent to more than 150,000 units, despite expectations that U.S. net farm income would decline after China slapped retaliatory tariffs on American crops. Japan’s Kubota Corp. has been struggling to impress investors, though. The stock slumped 26 percent in Tokyo in the past year, as of Jan. 18, while larger U.S. competitor Deere & Co. lost just 5 percent in New York. 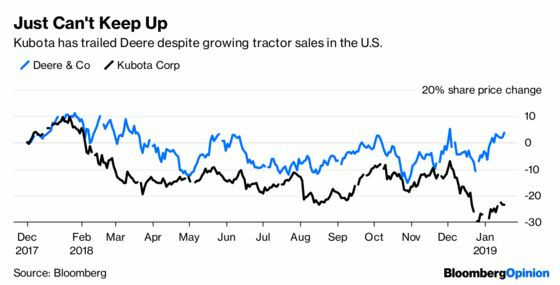 Deere has rebounded 23 percent from its 2018 low, versus a 13 percent advance for the Japanese company. U.S. shipments of small and medium-size tractors – Kubota’s specialty – rose 7 percent to a record in December, a trend reflected in Deere’s retail sales. Osaka-based Kubota, which counts North America as its biggest market, hasn’t released December sales yet. Part of the disappointment stems from Kubota’s inability to maintain margins. That’s partly a result of incentives and sales promotions that the company has offered farmers. Its financing business in the U.S., for instance, offers terms as loose as zero percent for 60 months and no down payment on new tractors. Cash flows were hit in the nine months to September as financing receivables rose alongside liabilities. U.S. rate increases last year also hurt Kubota, according to Goldman Sachs Group Inc.
Kubota’s Ebitda margins have trailed Deere’s by 5 percentage points to 10 percentage points. Costs between the two largest competitors have diverged, with the Japanese equipment maker’s climbing to 73 percent of net sales, although both have been affected by tariff pressures on raw materials. Kubota has been behind in raising prices. 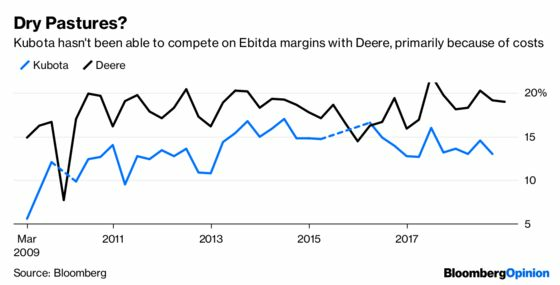 While profit growth is chugging along, its return on equity is about 11 percent, compared with more than 20 percent for Deere. Meanwhile, Deere has taken a larger chunk of the high-horsepower tractor market in the U.S. and has a head start in construction equipment after acquiring the Wirtgen Group in 2017. Playing catch-up, Kubota has started talking about larger tractors and is pinning hopes on construction machinery in North America. The trouble is, housing starts in the U.S. are starting to show signs of peaking. In any case, Kubota’s construction machinery segment remains a small portion of overall sales. A move into greener pastures such as India or Thailand could help. Kubota recently set up a joint venture in India, one of the world’s largest markets for farm tractors. Still, that won’t be enough to compensate for a drop in Chinese demand, which is already affecting the company’s Asian sales. Besides, Deere also has a large presence in India. Kubota’s strategy has been as slow-moving as its signature vehicles. This tractor maker needs to find a higher gear if it’s going to close the gap.